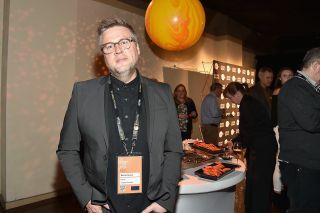 Michael Barnett, director of the documentary "The Mars Generation," attends the Salt Lake Opening Night Reception, presented by Zions Bank, during the 2017 Sundance Film Festival on Jan. 20, 2017, at Pierpont Place in Salt Lake City. A new documentary that follows a group of youngsters as they attend NASA Space Camp in Huntsville, Alabama, debuted at the Sundance Film Festival last week, and will be available on Netflix sometime this year. The new film, titled "The Mars Generation," provides a "revealing and intimate look" at a group of real Space Camp attendees, a few of whom were in attendance at the movie's opening at the Sundance Film Festival in Salt Lake City on Jan. 20, according to The Salt Lake Tribune. Directed by Michael Barnett, the movie "delves into space exploration's history and current state while looking beyond technology to what we will really need to get to the Red Planet: the power of youthful dreams," according to the movie's program description at Sundance. The film also features interviews with science communicators Neil deGrasse Tyson and Bill Nye, and NASA astronaut Sunita Williams. Barnett directed two full-length documentary features prior to "The Mars Generation," but neither was space- or science-themed. Barnett was granted "unprecedented" access to film at NASA's Space Camp in the summer of 2015, according to The Salt Lake Tribune. Space Camp hosts programs for kids and teens ages 9 to 18, as well as adults. The premiere took place on the same day as Donald Trump's inauguration, and according to the Tribune, Barnett said the arrival of the new administration "seems significant because he hopes it will jump-start a conversation about space exploration." "Now is not the time to become nearsighted about the big idea of becoming interplanetary," Barnett told the Tribune. "This film is about the generation who is going to take us to Mars — if they are empowered to do so." According to the Sundance program, the young stars of the movie "aspire to be the scientists, engineers and technicians on whose shoulders humanity will reach the Red Planet. Their infectious passion and optimism is the heart of the film, leaving little doubt that if given the support and opportunities they need, they will get us there." "The Mars Generation" will be available to stream on Netflix sometime in 2017.